This resource page is for the original 2016 class. In 2018 I expanded the topic to include non-Tunisian stitches too. It’s called Self-Healing Crochet Stitches to Cut and its resource page is here. Here’s a clickable list of resources for my 2016 national guild Steeked Tunisian Crochet Lace class. You’ll find patterns for designs shown, books mentioned, & articles recommended in class. Also, fashion inspiration for taking this topic in expressive new directions. 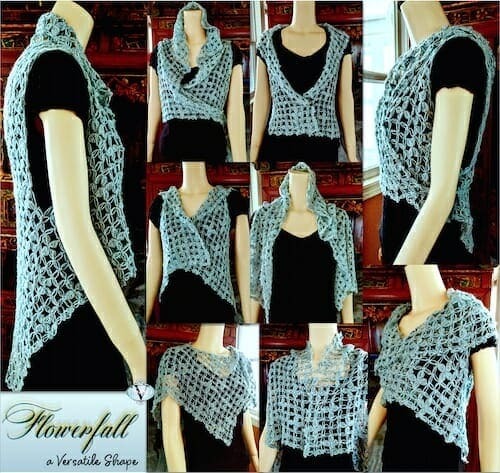 My published Tunisian Crochet downloadable patterns. Direct links: Mesmer pattern. Smokestack pattern. Self-updating search results for all steeked crochet patterns in Ravelry (total of 8 as of 6/1/16; 1 is Tunisian crochet). Self-updating search results for steeked crochet projects in Ravelry (13 as of 6/1/16). In Flickr, a search for steeked brought up over 600 knit-based images; steeked + tunisian brought up zero aside from my own images. The Fun Fast Fashions Part! Steeks: Ideas These are often simple shapes that become magically wearable and trendy with just a steek or two. Trend: the New Fringe (I thought today’s fringe was a passing fad but it continues to have a lot of mojo! That’s great for us. Many steeked Tunisian lace nets beg to be fringed.) If you cut a steek across several rows, turning that cut edge into fringe is the ideal thing to do with all the ends. Books re: Steeked Tunisian Lace? I could find nothing in books about steeking Tunisian crochet, even though it is so fun, easy, and versatile! (If you know of a source, please leave a comment.) Below are a few books that include some extended stitch patterns. 2000 (1991), Rebecca Jones: Tricot Crochet The Complete Book, Lacis Pubs., Berkeley CA. ISBN 978-1-891656-28-6. 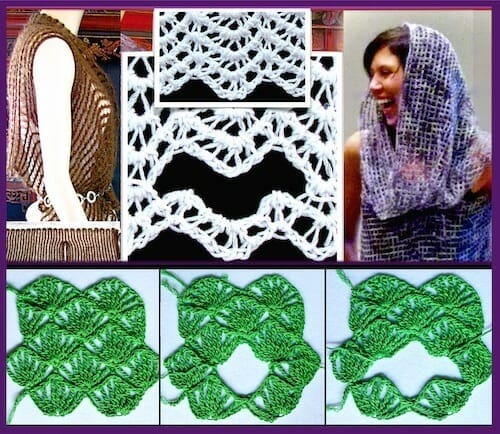 Offers three interesting variations of the Tunisian extended stitch net I used for Mesmer: “Open Mesh”, “Josephine Stitch”, and “Point de Chantilly”. The author shows several swatches of extended Tunisian stitches. See pages 34-43.